please say me whats going with the colors and how to do fix it? or it some bug with only my camera raw? so in DNG_Profile_Editor and PS i have real colors like it must be with my corrected profile. 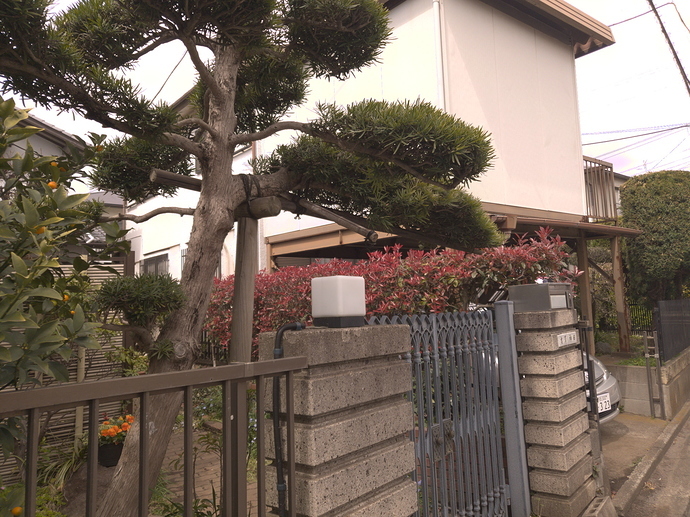 I looked at your DNG and your JPG, and I see the colors are different, but I don’t think the differences are huge. Also, I think this is completely expected behaviour, because different RAW editors work differently. You should not expect identical colours in RawTherapee as in Photoshop. Also, on a side note: don’t put sRGB as your working profile, because you will limit your color gamut greatly. anyway i love setup all details etc in Rawtherapee, but it real problem to setup colors becouse i see reference, it so far from real, i dont wanna lose my converting setup but it makes me vary sad, any solution for this case? also as i said i try to change all, also working profile, but in this case is change nothing. upd. it was a RawTherapee bug, it not renew profile if new have same name as loaded one. even if change between profiles in chekboxes. Your DCP might not be compatible with RawTherapee (don’t know for sure). Take and upload a raw photo of a normal outdoors scene lit by daylight. Do you have a color target? You can make color adjustments in the L*a*b* tool, h=f(h) curve. How can I check this and what can I do to fix it? in "the normal outdoors scene lit by daylight "you don’t see a reference in front of your eyes. And you can’t know what exactly the HSL (hue and color) was in the leaves, skin and so on … . it is a little more difficult than setting up a profile, and if I’m not mistaken, this is processing after the raw , and the profile is before. 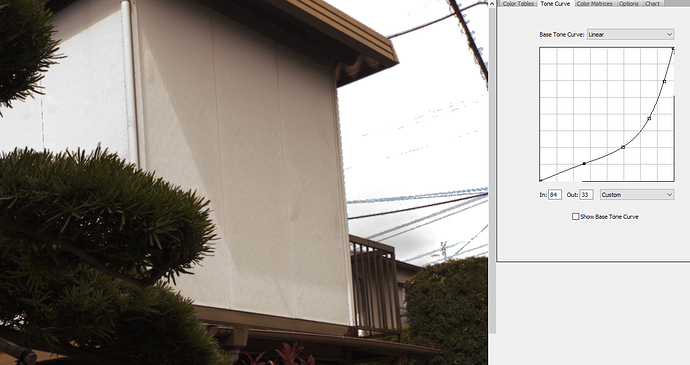 As your second photo is overexposed, some DNG data are clipped (mainly house walls and sky ). So to recover some data, I just underexposed in RT by 1/2 EV and clicked Highlight reconstruction and choose color-propagation method. but someone needs to inform the developer. I just hope that there will be support, because it may not be there at all, maybe for some reason will not want to add it. ps hgjhgjh what is it? That top right section of sky and cables is very overexposed so not unusual to get pink/purple when recovering detail. In RT (different versions) I used EV at -3 to get reasonable compromise. Then took it into an external editor to apply a graduated filter which seems to be what you need to do. Grad filter applied quickly without accuracy. and its real colors…no pinks no editings. please stop posting your coloring skills…thank you. Sorry @dssdd, but you don’t get to control how people respond. They are, after all, just trying to help you obtain a nice looking photo from what you’ve posted. These are people kind enough to take time out of their day to try and directly help you. We have zero paid support staff. That being said, it seems this camera isn’t supported in RT yet, so you should work with @heckflosse, a developer of RT, to get that support added. it seems this camera isn’t supported in RT yet, so you should work with @heckflosse, a developer of RT, to get that support added. maybe is reason that no one dev say nothing about will they do support or not or this is different problem. p/s since you moderator can you lock this topic to reply here only devs and me? or at least will it be solve after or a problem in another and better not wait? 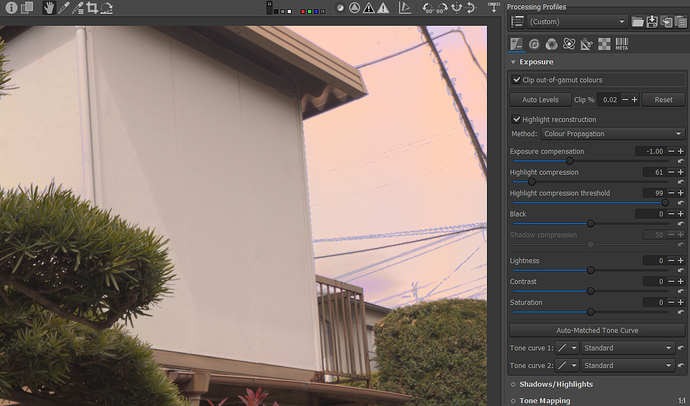 @dssdd, if the software doesn’t have the color primaries for your camera, the colors won’t look right. I just tried to open your second raw file in my software, which uses both the dcraw and RawTherapee camera data, and your camera wasn’t found. That green line at the right is your camera’s saturation point, where it can no longer record a valid light intensity. It’s a green line because the green channel is in front. The pixels counted there can no longer express the measured tone, or the asserted color, from the scene, they’re just arbitrarily white. Both the software you came from and RawTherapee can engage algorithms that make up pixels that look nice instead of flat white, but in terms of what the scene contained there’s no data. 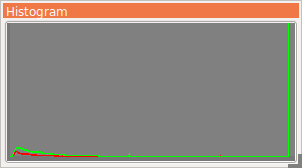 Further, when white balance correction is applied, the three channels shift accordingly, and that single spike becomes three separate ones, and the pink shade is because the green channel is the left-most spike and the other two are close or at the right. Software usually scales the image so they all three go back to saturation, or it does some “reconstruction” trick. I think these two things describe why your colors are off. It looks logical that the software does not support the camera. but also regarding the profile editor, the RT does not understand the profiles made by it, and this is also a problem, because I can not even manually correct them. anyway, I just want to get an off answer from the developers, if it’s really problem only in camera support, or not, and help them to more speedy implementation of it if I can. You’re looking at this the wrong way. Developers add support when users provide the sample images necessary to do so or when a user requests it. Developers add support when users provide the sample images necessary to do so or when a user requests it. it is good if it like this! ill do provide of any specific samples if i can.